Melvyn Bragg discusses how the formation of the Royal Society heralded the dawning of a new scientific era in the 17th century. Melvyn Bragg and guests discuss the formation of the Royal Society. In the 17th century the natural philosopher Francis Bacon heralded the new age of science. The frontispiece to his 1620 edition of the Instauratio Magna depicted a galleon travelling between the metaphorical Pillars of Hercules thought to lie at the Strait of Gibraltar and believed to mark the end of the known world. The image encapsulated Bacon's desire to sail beyond the limits set by Aristotle and the curriculum of the Ancient universities towards the new continent of science. Bacon imagined practical scientists engaged in a collaborative effort to expand knowledge of the natural world. But it was not until the turbulence of the Civil War and Commonwealth years had passed that such a group of scientists would gather together in London for this purpose, and form the Royal Society. Amongst its members were Robert Boyle, Robert Hooke, Christopher Wren and Isaac Newton, who explicitly rejected dogma and insisted on practical experimentation and observation. 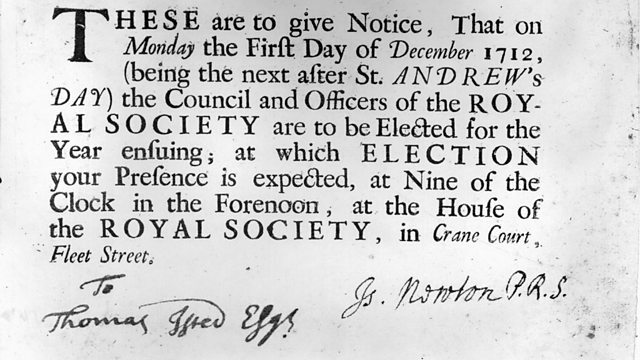 How was the Royal Society formed against a backdrop of religious and political strife? What was it about the way this group of men worked that allowed each individual to flourish in his own field? How successful was the Royal Society in disseminating the benefits of experimental science and what is its enduring legacy? With Stephen Pumfrey, Senior Lecturer in the History of Science at the University of Lancaster; Lisa Jardine, Professor of Renaissance Studies at Queen Mary, University of London; Michael Hunter, Professor of History at Birkbeck, University of London.